One cure for missing your children, away for so many weeks during the summer, is to watch and listen to all of the life in the garden. In both my vegetable garden, and my flower gardens, scattered all around the yard, bumblebees are at work in the monarda and in the yellow cucumber and tomato blossoms. They are so certain of their worth and my intrusion, that I’ve been bitten more than once. I’ve learned to listen to the warning hum near my head and to move away instead of swatting. Also at work in the monarda with the bees is the amazing hummingbird moth. 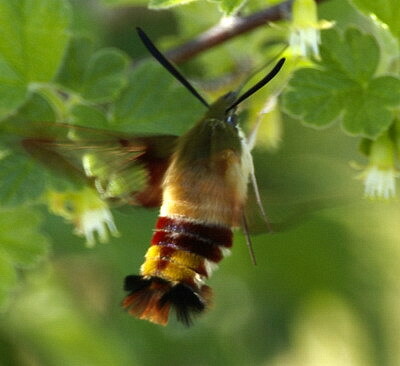 They are larger than bumblebees and smaller than hummingbirds, but they sip nectar through a long proboscis and their wings hum just like those they imitate. The first time I saw one, I thought I was hallucinating from exhaustion, brought on by three children all younger than 5. When I saw them again this year, I was bereft of children, and found their presence and soft humming a comfort. They fly, hum, and sip, just like their namesake. I find it calming to watch these insects work. It’s as if I can rest peacefully, knowing that the work of gathering food continues. Someone’s children are being fed.